Blowout pricing until the end of March! Tractor and loader limited to 2 in stock. 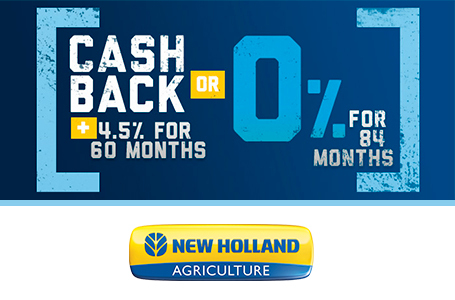 low low pricing with 0% financing! 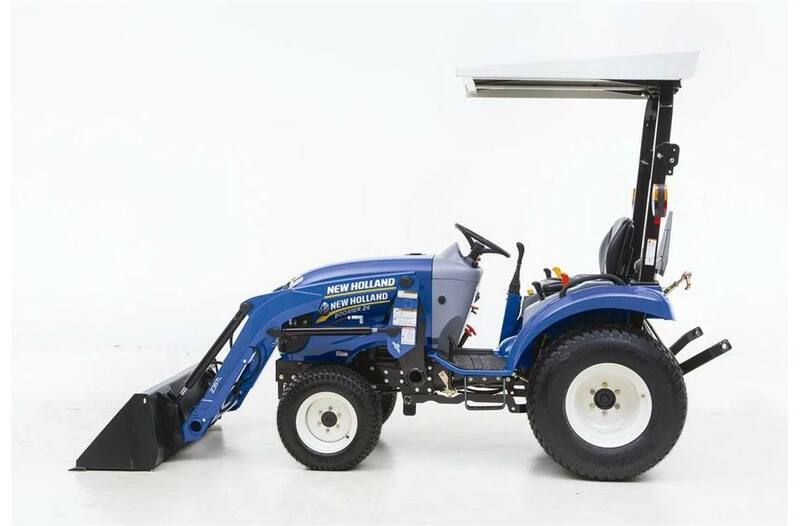 Warning, This Is Not A Toy: If your personal piece of heaven is between one and five acres, your plans can quickly outgrow the capabilities of ordinary yard tractors or lawn and garden tractors. When you need to haul dirt and mulch, mow acres of grass, till a garden or plow snow, a versatile Boomer™ 24 compact tractor can power all the implements you'll need and more. The Boomer 24 is a small tractor, but it can accomplish big things, making it the best compact tractor for the money. 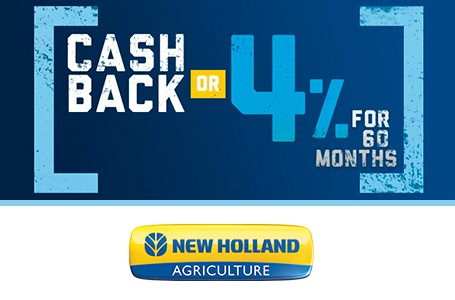 New Holland Has Your Back With Boomer Guard6: Peace of mind comes standard with the Boomer™ 24 tractors because it is backed by a FREE Boomer Guard6 Limited Warranty. It provides 6 years of worry-free operation, including 2 years of “bumper-to-bumper" coverage plus an extra 4 years of powertrain protection. It’s among the best warranties in the industry. More Power Working For You: For dependability you can count on, Boomer™ 24 compact tractors featuring powerful Mitsubishi diesel engines deliver 24 horsepower. What's more, the majority of the gross engine horsepower gets turned into usable power at the PTO to run a variety of implements thanks to an ultra-efficient Tier 4 driveline. Clean Tier 4 Final Compliant Engines: 3-cylinder engines meet Tier 4 Final regulations without the need for additional fluids or hardware. The Boomer™ 24 will run clean all day long with no extra operator input. They run clean - automatically. Fewer Fill-Ups To Slow You Down: How far will you go with one of the largest fuel tanks on the market? Fill up the productivity-boosting 6.6-gallon, hood -mounted fuel tank and see for yourself. It's sure to last all day long. 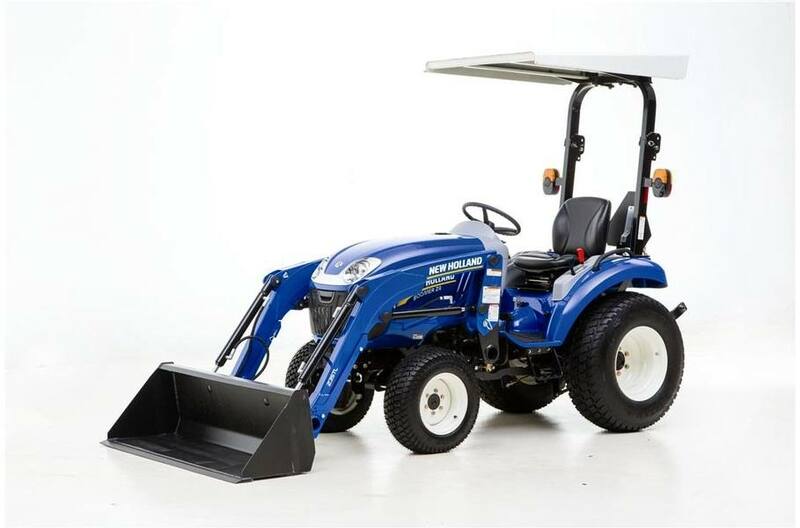 Well-Equipped For Inclement Weather: To ensure fast starts in cold weather, Boomer™ 24 compact tractors come equipped with a quick-heating glow plug package and a heavy-duty 560 CCA battery that provides plenty of cranking power. Made To Accommodate More: Superior battery charging and the capability to handle the higher demand of additional electrical accessories provided by a 50-amp alternator. No Gears To Get In Your Way: Driving a tractor has never been so easy; thanks to a high-performance, two-range dual-pedal hydrostatic transmission that eliminates the need for gears or clutching. 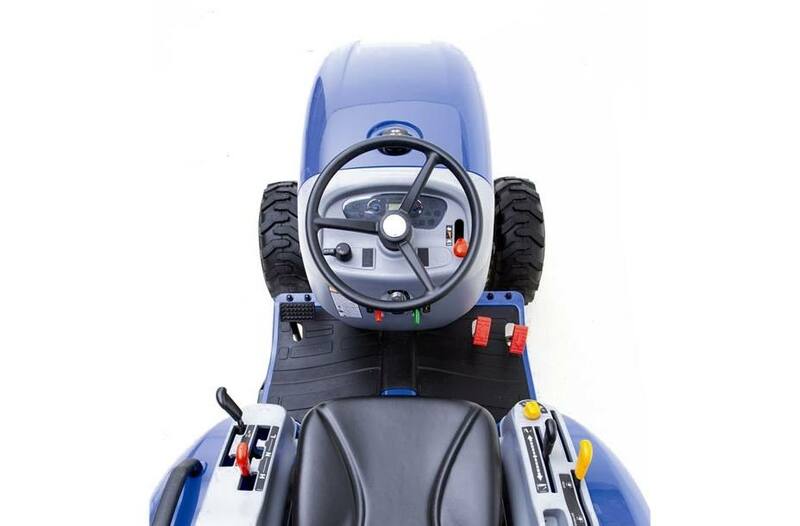 Now you can control the exact speed you want for each task and shuttle more easily when mowing or doing loader work using the new dual forward and reverse foot pedals to propel the tractor. More Traction To Take On More Tasks: To help you work more efficiently, four-wheel drive (4WD) comes standard on Boomer™ 24 compact tractors. Simply use the lever on the left fender to shift from 2WD to 4WD when you need some extra traction. Cruise Through Tasks: Give your right foot a rest. Select and maintain a constant working speed with the standard cruise control. It really comes in handy for mowing larger properties and transporting your tractor from one location to another. Two Ranges That Run The Gamut: Use the left-hand fender control pod to select the proper range for the task. Power Through Your Everyday Projects: Whether you plan to use a front-mounted loader, broom or blade to move mulch, gravel or snow, Boomer™ 24 compact tractors pack enough hydraulic power to keep up with your demands. You'll also have lots of power at the rear three-point hitch to lift and operate heavy implements to get more done. Ample Power To Go Around: Responsive power steering is ensured by a 2.9-gpm dedicated steering pump. A separate 6.7-gpm implement pump powers implements and attachments for a total hydraulic flow of 9.5 gpm. This way, one system won't tax the other during demanding conditions. Two PTO Options: Versatility is built right in. An independent, mid PTO (2,000 rpm) can power a mid-mount mower and front-mounted implements like a snow blower or rotary broom. And an electro-hydraulically, independent, rear PTO (540 rpm) allows you to use rear-mounted implements such as a rotary tiller or utility rotary cutter. Both are electro-hydraulically engaged, making starting or stopping the implement as easy as turning a switch. Premium Three-Point Hitch: Handle heavy duty tasks with a Category I three-point hitch that provides a 1,433-pound lift capacity. Precisely adjust the drop rate of three-point mounted implements with a flow control valve. 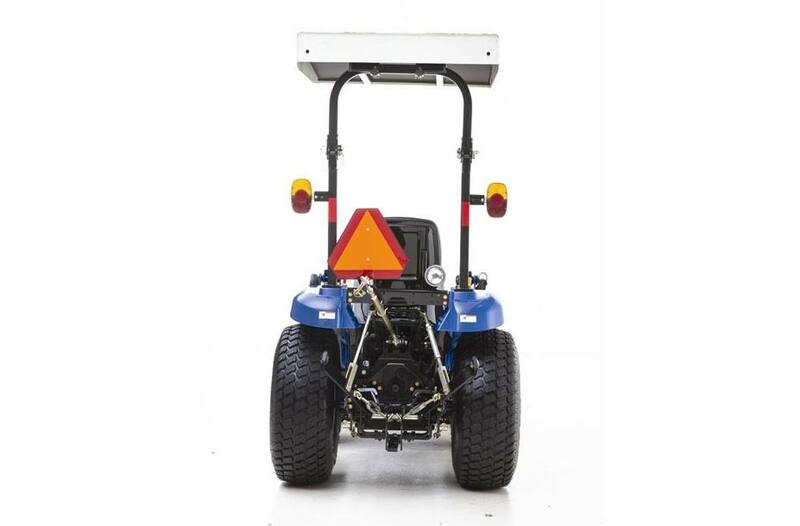 Adjust rear-mounted implements safely thanks to adjustable stabilizers and a mechanical leveling mechanism. Advanced Ergonomics In Action: Comfort is the key to productivity. That's why Boomer™ 24 compact tractors are designed with your comfort in mind. You'll be able to work efficiently for longer periods of time thanks to the advanced ergonomic features found on the spacious and comfortable Boomer platform. Premium Seating Comes Standard: A high-backed, flip-up, contoured seat glides on a fore/aft track to put you in the right spot to maximize your comfort and visibility. Dual Pedal Hst: The Boomer™ 24 has been upgraded with a dual pedal HST, one pedal to go forward, one pedal to go backwards. A simple, smart design to keep you safe and help you to work fast. Designed With Safety And Storage In Mind: The Roll Over Protection System (ROPS) helps protects you if the machine tips over. 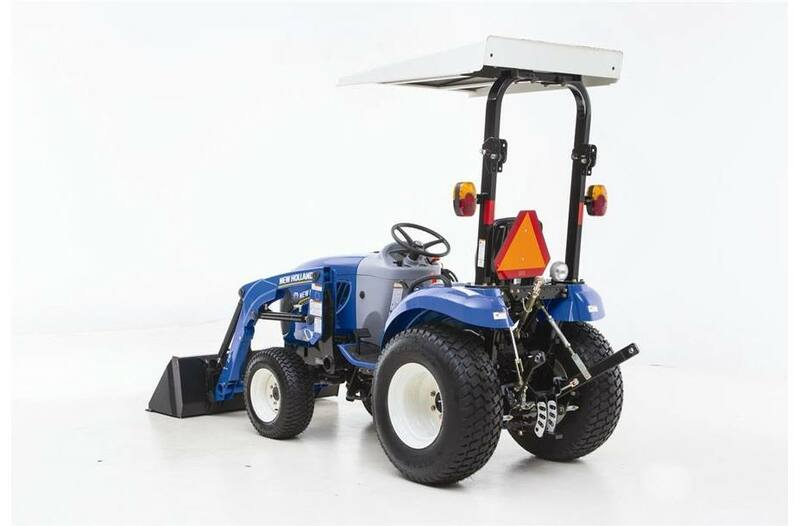 All Boomer compact tractors have a foldable ROPS so you can drive under trees and lower overhangs, and easily store the tractor in low-clearance areas. Remember to always wear your seatbelt. Additional Features: • Easy-to-reach controls are color-coded and labeled with their functions. • Dashboard instrumentation includes fuel gauge, temperature gauge, digital tachometer and hour meter, cold starting aid indicator and warning lights for engine oil pressure and battery charge. • Added conveniences include a cup holder and tool tray. Outstanding Versatility, Strength And Visibility: If you need to move gravel, mulch, plants, dirt or hay as quickly as possible, you'll want a 235TLA front-end loader. 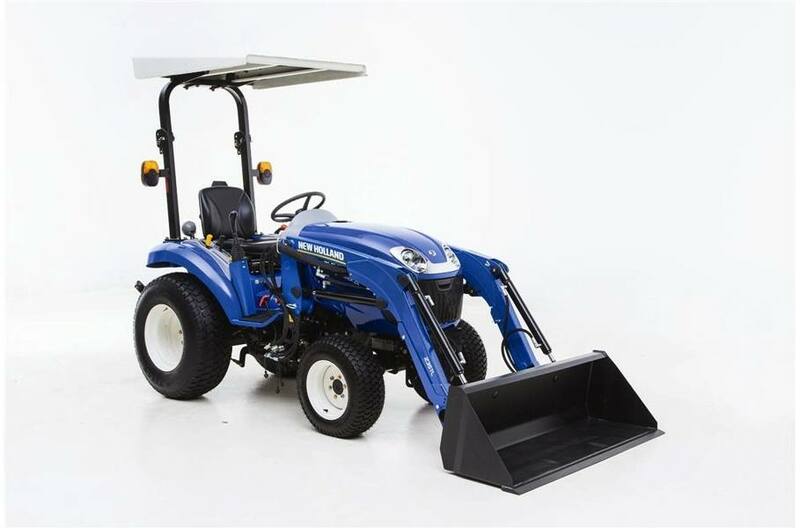 It features a distinctive, curved-boom design that integrates with the sleek hood of your Boomer™ 24 compact tractor, giving you a clear view of the loader's operation for added safety and productivity. Easy To Operate: The joystick control mounts on the right fender and is positioned comfortably within reach of the operator. Excellent Value And Performance: Invest in your future. 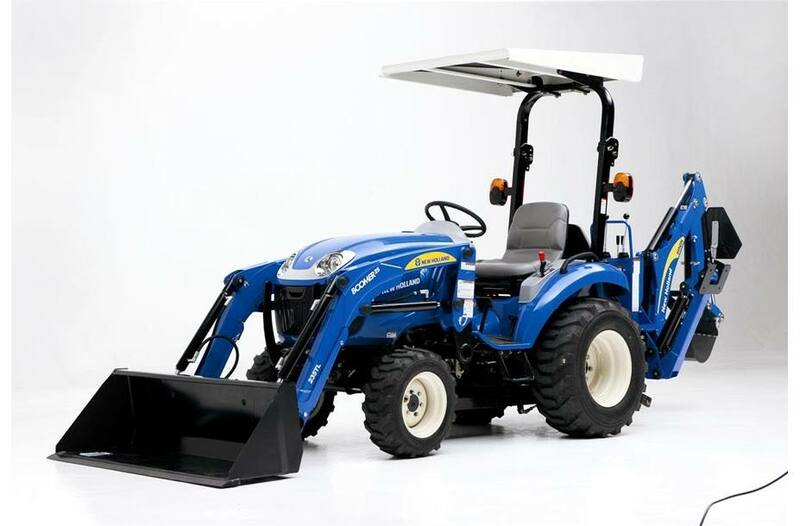 The 235TLA front-end loader is designed for durability, long life and excellent reliability. It offers construction-grade, heavily reinforced toughness at a value price. Mow Like A Pro: Whether you have one acre to mow, or have multiple acres to tackle, a Boomer™ 24 with a mid-mount mower can help you cut it down to a more manageable size. When you've outgrown a riding mower, a Boomer™ 24 compact tractor is right for you. 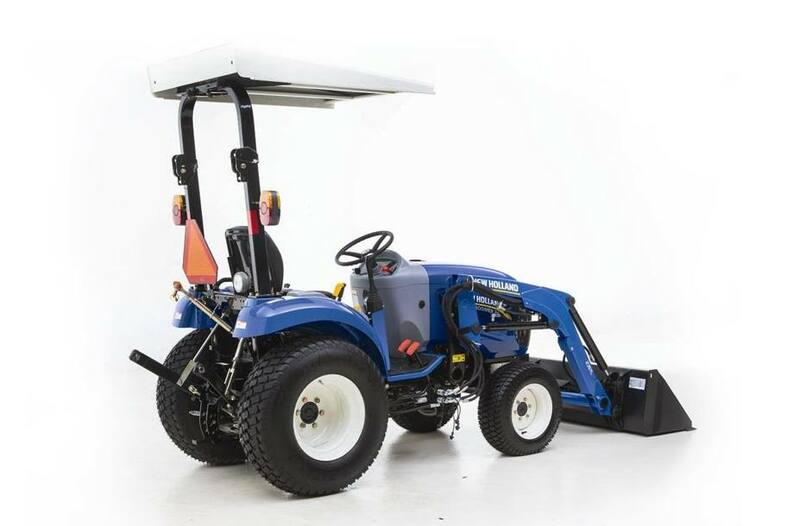 Adjusts To Changing Conditions: For a uniform cut, a free-floating, four-bar linkage allows the mower to move up and down to follow the contours of your land. Powerful, Precision Cutting: Three overlapping blades spin at up to 18,000 ft per minute for smooth, efficient cutting action. Mower Deck Height Control: You can easily change the cutting height with a mechanical height adjustment located on the 3-point hitch. Built To Mow For Many Years: The mid-mount mower's fabricated design is stronger than the competition and can stand up to many seasons of use. 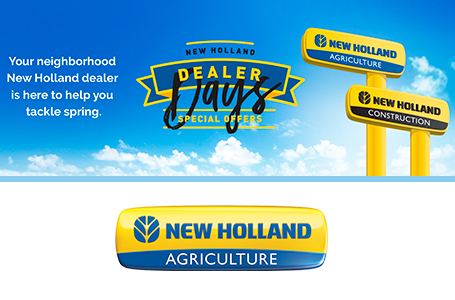 New Holland Has Your Back With Boomer Guard6: Peace of mind comes standard with Boomer™ 35/40/45/50/55 compact tractors because they are backed by a FREE Boomer Guard6 Limited Warranty. It provides 6 years of worry-free operation, including 2 years of “bumper-to-bumper” coverage plus an extra 4 years of powertrain protection. It’s among the best warranties in the industry. Maintenance Meets Convenience: Maintaining a Boomer™ 24 compact tractor is easy because all routine maintenance points are located on the right side of the engine. Plus, you can easily check engine oil level without raising the hood and without removing the loader. Best-In-Class Access: Access doesn’t get any easier than this. The high-pivot hood lifts on a mechanical rod to provide complete access to the engine, radiator and battery for easy inspection and routine maintenance. Filters Provide All-Around Protection: • Single-element fuel filter protects the engine's fuel injection system from rust, dirt and water. • A full-flow, spin-on oil filter provides protection to the engine lubricating system.